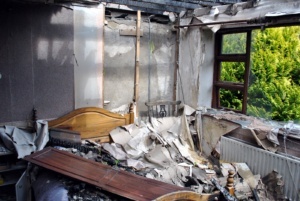 If you are making a fire damage insurance claim, it can be really stressful and overwhelming as they can be very complex to the point where you just don’t know where to start or what to do! So why not take advantage of our FREE Claims Management service, which will give your all the help and advice you need at a time you need it the most! With most fire damage insurance claims, what initially appears to be minor damage can actually affect the structural integrity of a building and that’s why it’s important that your fire damaged property is thoroughly assessed. IC Assist will conduct a thorough survey of the damage, paying particular attention to issues that affect your safety such as electrics and structural stability of the building and not just the redecoration that is required. Our specialists will also assess the water damage caused as a result of extinguishing the fire. As, if water damage is not assessed correctly and your property isn’t thoroughly dried out, it can cause further problems later on. Mould and rot are the biggest problems that need to be prevented, as if left untreated can spread rapidly and lead to structural issues with your property and can also affect your health. Depending on the nature of your claim, we can install drying equipment during our initial survey of the damage, so your property can start drying straight away. This will not only help to mitigate your claim, but most importantly, it will get your property drying sooner and therefore enable repairs to be started sooner.